When you think of workplace flexibility, what types of workers come to mind? What about the men and women who help to protect our country? While you might not immediately equate the armed forces with workplace flexibility, those who protect and serve definitely need flex, too. Here are some of the reasons why workplace flexibility is crucial, straight from military service professionals and their families. To be able to continue your career wherever your family is stationed. There’s no doubt about it: Military families often move a lot. So trying to keep a consistent job can be challenging for the spouses of military personnel. Flex means that you don’t have to give up your job simply because your spouse is stationed somewhere new. To help contribute financially to the family. As Americans, we owe a great debt to those who serve in the armed forces. By having flexible work options, military families can continue to earn a living despite retirement or discharge from the armed forces. To continue working despite a disability. For many disabled Americans, getting to and from the workplace just isn’t a reality. 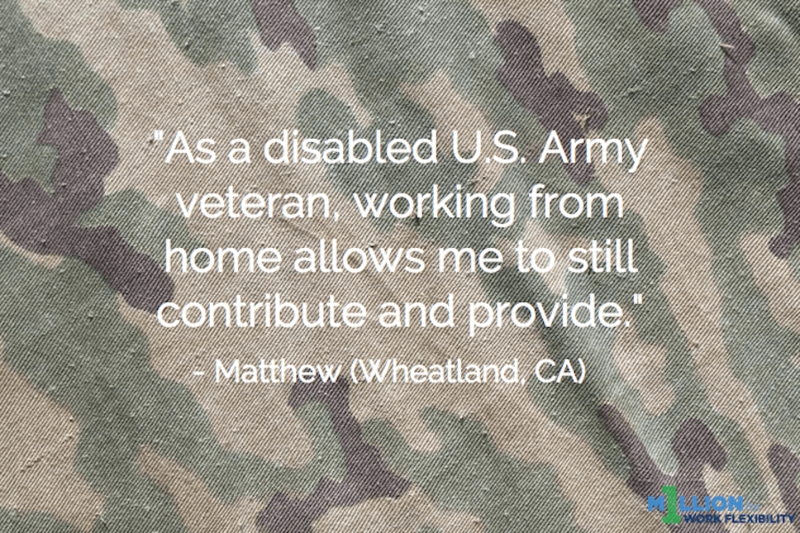 Flexible work allows disabled workers—particularly veterans—the chance to continue working despite physical challenges. Because working military moms (and dads!) want work-life balance, too. Oftentimes, we think of working mothers are those who are clocking into an office. But working moms come in all career types, and military moms and veterans are no exception to needing work flexibility in order to be an active part of their children’s lives. Our armed forces are a key part of the U.S. workforce. By having flexible work options, active duty military, veterans, and their spouses can have the careers that they want and care for their families, too, regardless of factors that could potentially deter them from being able to work, such as a disability or geographic location. Don’t they deserve it?